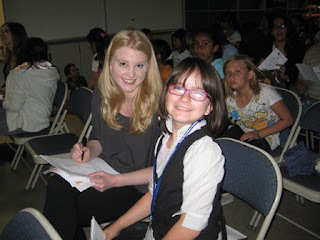 Riley was lucky enough to participate in the Young Storytellers program, where she's been working with a professional writer as a mentor to write a screenplay. A 5-page screenplay, but a screenplay nonetheless. She learned the craft of storytelling, she wrote her story, and we had the opportunity to see it performed by professional actors. And yes, I know I am her biased mom, but it just reaffirmed my belief that this girl has an incredible depth to her soul. At the ripe old age of 10. Her play delved into the complex issue of loving without being there. And yes, I'm sure the lack of Dad in her life has something to do with it. But she had an ending; a conclusion. And it was one of acceptance. That's what makes her so beautiful to me; her ability to accept people as they are. She can sound cold at times. She'll make jokes at her father's expense. She'll say she doesn't care that he's not around. But I don't think she is cold about it. I think she makes jokes because hey, might as well laugh rather than cry. And it's not that she doesn't care, it's just that he's been gone so long, and she's living her life, and lo and behold, she can do that without him. She's also one of the most joyous people I know. This might come out wrong, but she reminds me of a dog hanging out a car window, reveling in the flight. Riley loves life. She loves jumping up and down, snuggling, running for no reason. She's wise enough beyond her years to actually enjoy and revel in her youth. I also love that she threw herself into this. Over and over, Sylvia has been in the spotlight this year, and it hasn't always been easy to be her little sister. But she hasn't let herself be a victim to it. She's cheered her sister on all the way, and proudly took this chance to let it be Riley's turn. She recognizes that she has different strengths than Sylvia, and utilizes them to her fullest. Riley has this quiet strength. Of soul, of character, of self. I wish I knew more grown-ups like Riley. I wish I was more like Riley. What a beautiful post. This may be one of my favorites. Both of your daughters sound like such joy. It was lovely to read about Riley writing something so powerful. She obviously has a great impact on those around her. What a cool program. Riley should be very proud of her accomplishment. I wish I knew more people like her too. That's awesome. You have every reason to be proud! How lovely that they are reaching acceptance. That is much more difficult than we realize. I'm far from being a child, and I still struggle with it. Bravo to you - and them. Wow...to have kids grow and for a mom to wish she were like them....NEVER thought about it before. I think you've raised them very well indeed...kudos!